For most Gujaratis the Diwali celebrations began from yesterday with Rama Ekadashi, whereby if you fast on this day, all your sins are forgiven and you attain salvation. However, in typical Gujarati style, fasting food or agyaras food is prepared. No grains or beans, onion, garlic, many vegetables are not allowed. However sabudana khichdi, moriyo, potatoes, etc are prepared. Today is Vagh Baras or Vase Baras. On this day the cow and calf are worshipped. Vagh means debt and today all debts are cleared and new transactions are done in new ledger books after Labh Pancham. The word Vaak Baras is mispronounced as Vagh Baras. Vaak or Vani means Goddess Saraswati, the one who blesses us with language and knowledge. On this day Goddess Saraswati is worshipped. It is believed that Goddess Lakshmi only comes to bless our homes if before we worship her, we worship Goddess Saraswati. One must worship Goddess Saraswati on this 12th dark day of Aso and ask that we that before the Goddess comes as Lakshmi to our homes she comes first comes as the Saraswati Ma to bless us with good deeds, good words and to help us control our tongues against any evil or hurtful words that we may utter. Tomorrow is Dhanteras. On this day Goddess Lakshmi is worshipped but before that, rangolis are prepared, homes are decorated and also torans (decorated door hangings) are put on the entrance. A torn made using mango leaves or ashopalav leaves is most auspicious. On this day something of gold, silver or a kitchen utensil is bought and Gujaratis believe that money spent on this day brings prosperity to their families and homes. During the Pooja, old coins, gold ornaments etc are also offered to Lakshmi. Most Gujarati homes will either prepare lapsi or kaunsar, tomorrow along with tuvar dal, rice, rotis, sabjis and savory dishes. Then comes Kali Chaudas. Kali means dark and chaudas is 14th. This day is devoted to Kali Ma or Shakti. It is believed that Kali Ma killed the wicked Raktavija on this day. It is also the day it is believed that Lord Hanuman put the whole sun in his mouth thus causing darkness. When he was a baby he was feeling hungry. Thinking that the sun is a fruit he flew up to the sky and put the sun in his mouth. Lord Indra had to hit him with his vajra so that the sun could be released from Hanuman’s mouth. Its on this when we make doodh pak, puri, kadhi, bhajias etc. On this day a bit of the food is put on the roof tops of the homes so that the forefathers can have a feast. Next is Diwali Day. On this day usually invite family and friends home. On this day huge feasts are prepared for all to enjoy. Usually gur na ladwa, alone with tuvar dal, rotis, sabjis, chana nu shaak, rice, savories etc are prepared and enjoyed by all. Its a day presents are exchanged, new clothes are bought. Gujaratis celebrate their New Year or Bestu Varsh immediately are Diwali. I remember years back we had to get up really early in the morning, get ready in our new clothes and new jewelry and go to the temple. It was like temple hopping. Its that one day in the year when we would go to all the temples. By the time all the temple visits are over, its lunch time. Then its time to visit all relatives who are older to us to get their blessings. Nowadays hubby and I don’t really get up that early. Temple hopping has become difficult because of all the traffic and not many relatives are left in Mombasa. However, I try and visit as many as I can. Its also Govardhan Puja, so I prepare something to offer as Annakoot. Annakoot is mountain. A ‘mountain’ of food is offered on this day. Its a special day as its on this day that Lord Krishna lifted the Govardhan Mountain on his little finger to protect the people of Vrindavan from the torrential rains. Its also the day when all varieties of vegetarian food is offered to the deities. In the evening, we put our best clothes and go to the local community or samaj to meet and greet our community people and enjoy a feast with them. Next day is Bhai Beej, a day when sisters invite their brothers to their homes for a lavish meal. In return the brothers shower the sisters with gifts and love. On kartak sud pancham is Labh Pancham. On this day shopkeepers and businessmen start their business for the year. New ledgers are opened by writing Shubh(auspicious) on the left, Labh (profit) on the right and sathiya in the middle of the first page. On Kartak Poornima (full moon) or 15th day, is Dev Diwali, the Diwali for Devtas or Gods. Its believed that its on this day that Lord Vishnu returns after completing his stay in Bali. Its also the day Lord Vishnu takes on the form of the fish Matsya to rescue the first man Manu. Its believed that its on this day that Lord Krishna worshipped Radha. The #114th theme for the FoodieMonday/Bloghop group we decided as Diwali. To prepare any Diwali food. I decided to go the savory path by making these delicious masala farsi puri. Its my favorite and no Diwali is complete in our home without farsi puri. Usually its made using plain flour but this Diwali I tried out a mixture of wheat and plain flour. The result was a delicious snack and hubby couldn’t tell the difference. Happy Diwali to you all. May the coming year bring good health, peace and happiness to you and your family. Mix the flours, salt, cumin, carom and sesame seeds, turmeric powder and asafetida. Chop the butter into small pieces and add it to the flour mixture. Rub the butter into the flour using your finger tips till you get a breadcrumb consistency. Add the ginger and chilli paste and mix into the flour. Add kasuri and fresh methi and mix. Add the water little at a time and make a dough that is not too soft or too hard. It should not be sticky. Rest the dough for 30 minutes. Divide the dough into nearly 40 small balls, the size of a nutmeg. Roll each ball into a circle of about 3-3½” diameter with a rolling pin. Using a knife make small cuts all over the puri. Keep it on a plate or tray and cover it with a cloth so that the puri does not dry up. Repeat steps 9-11 with the remaining dough. Make sure the puris are thin. Heat oil in a wok or karai over medium heat. Drop a tiny piece of the dough into the oil. If it comes up to the top immediately then the oil is ready. Depending on the size of the wok or karai gently drop in 6-8 puris. Flip the puris over several times. Fry till they are crispy and light golden in colour. Remove the puris from the oil and keep it in a colander. Repeat steps 15-18 till all the puris are fried. Let them cool down a bit before storing in a jar or airtight tin. Serve masala farsi puri with tea or coffee. Don’t need to add kasuri methi if you don’t have any. Make sure you roll them thin otherwise they will not turn out crispy. So informative write up. Enjoyed reading. Farsi puri looks delicious. Will try it soon. Loved reading your write up. These puri's look so inviting and gives a festive look. Happy Diwali!! 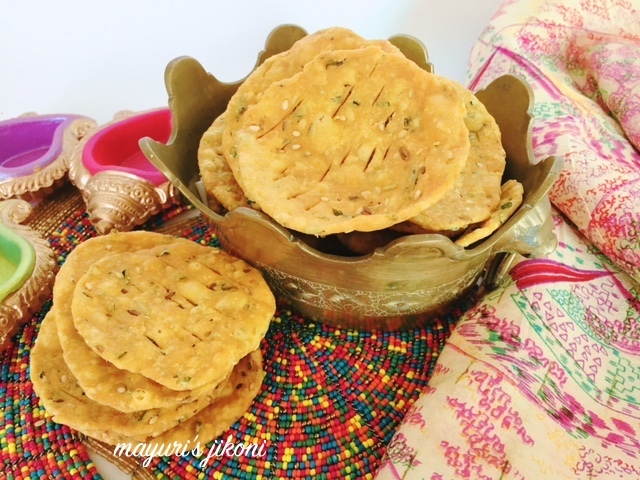 Masala farsi puris are perfect for this festive season.Awesome share. Farsi puris mine and my son's weakness, absolutely love it with masala chai..yours just too tempting. Hope u had lovely Diwali. I love reading about other people's cultural celebrations and the food looks mouthwatering – wish I had some! These are perfect for Diwali season.. after eating all the sweets you need some namkeen too. I would love to munch them with tea.